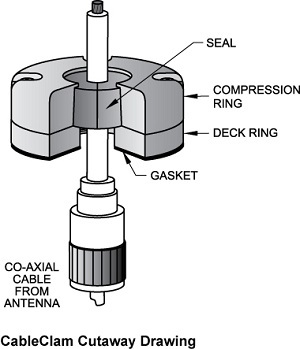 Cable clams allow a cable with a plug on the end to pass through a deck and still make a waterproof seal . They come in three different sizes. If you are a bit nervous about cutting the end plug off your new GPS antenna a Cable Clam is the way to go. New for 2014 will be Cable Clams with a stainless steel dress top. Maintaining a waterproof deck is essential to the care and maintenance of your yacht, as well as the safety of your passengers. When you need to pass electrical wires through the deck, it can leave a gap that can allow water to pass through, creating safety issues and contributing to the breakdown of your deck or the finish over time. Cable clams help you to avoid this problem. Cable clams create a waterproof seal around cords that require a larger opening to pass through a plug. You can cut the hole big enough for the plug, then seal it with the cable clam. Newer cable clams feature a stainless steel dress top, ensuring that they only add to the beauty of your deck, not distract from it. Shop for cable claims by size. 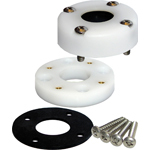 They come with everything you need for installation, including the hardware.